By descent to the sitter's great-grand-daughter, Miss. Mayor, Queen's Gate House, Kingston Hill; her sale, Christie's, London, 20 May 1927, lot 33 (5,880 gns. to Colnaghi). with P. & D. Colnaghi Ltd., London, 1951, from whom purchased by the family of the present owner. Kenneth Garlick, Sir Thomas Lawrence, London, 1954, p. 40. Kenneth Garlick, 'A Catalogue of the Paintings, Drawings and Pastels of Sir Thomas Lawrence', Walpole Society, 1964, XXXIX, p. 96. Kenneth Garlick, Sir Thomas Lawrence, Oxford, 1989, p. 200, no. 357. Brighton, Brighton Art Gallery, Sir Thomas Lawrence P.R.A., 1951, no. 9. The precocious young Lawrence first exhibited at the Royal Academy in 1787 at the age of only eighteen and his impact was immediate. Two years later he exhibited a full-length portrait of Philadelphia, Lady Cremorne (private collection) of such astonishing brilliance and technical virtuosity for a young artist, that it resulted in a commission to paint Queen Charlotte and her daughter, Princess Adelaide the following year. 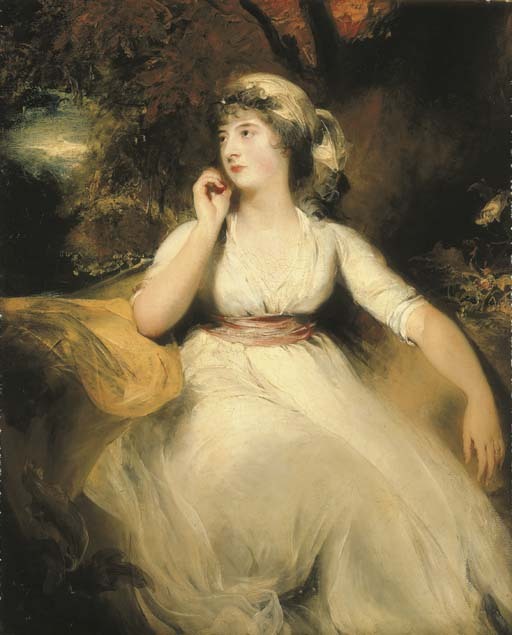 By the time that the 24 year-old Lawrence painted the present portrait of Miss Selina Peckwell in 1793 at around the time of her marriage to George Grote, he was already Painter in Ordinary to the King in succession to Reynolds and was about to be elected a full Academician. In common with Lawrence's portraits of the 1790s the picture has a vitality and exuberance that is expressed in the fluid handling of the paint and the richness of the paint surface. The background is particularly strong and forceful and reveals his ability as a landscape painter. Described as being 'of uncommon beauty' and 'noted for her gaiety', Selina Peckwell (1775-1845), was the daughter of the celebrated preacher, the Rev. Dr. Henry Peckwell. In 1793, Selina married the banker, George Grote of Threadneedle Street and Clay Hill, Beckenham. They had eleven children of whom their eldest son, George, after a career in politics became a important historian, noted for his History of Greece.